The EcoSmart X2 Filter is a practical solution for regulatory compliance and environmental leadership. 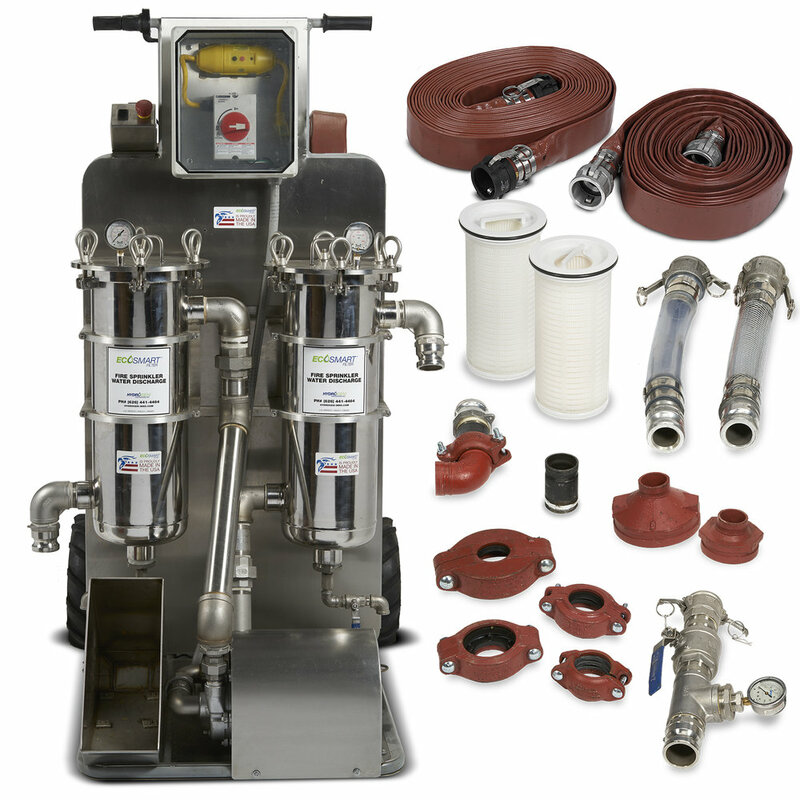 The EcoSmart X2 Motorized Filter Cart is an integrated system comprised of a six wheel battery operated cart, 2-S/S filter vessels, S/S Centrifugal pump, S/S control valve assembly, S/S pipe and fittings, S/S splash pans, S/S protective covers, on/off switch, GFI, protected by NEMA rated enclosures, cam & grooved flat hoses, cam & groove clear site tube hoses and various size reducing Victaulic couplings. The EcoSmart X2 Motorized Filtration System Cart was designed to be easy to use without special training in rough and flat terrains and to be an effective, portable filtration system when flushing fire sprinkler cross mains for obstructions, sediment and suspended solids in wet delivery systems and the dangerous metal ZINC found in trapped water in testing and draining galvanized piping of special hazard pre-action and dry systems. Attach victaulic reducing coupling and 2” - groove x male quick connect transition piece - attached hose to clear site tube. EcoSmart X2 Filter configured properly.